The creation of Cuvee des Sommeliers is a young property in the Southern Rhone Valley, It only dates back to 1998. The estate came about when the owner of the vineyard, Jacques Mestre retired and split his vineyards into two pieces allowing both his son, Christophe Mestre and and his daughter Christine Estoulle Mestre the ability to have their own estates. The son, Christophe Mestre, took over management of Cuvee des Sommeliers. The daughter, Christine Estoulle Mestre when on her own and created Domaine Les Moulins des Saints. Cuvee des Sommeliers has 10.7 hectares in the Chateauneuf du Pape appellation. 9.4 hectares are planted for grapes to produce red wine. 1.3 hectares are reserved for the production of white wine grapes. Cuvee des Sommeliers produces 2 wines, 1 red Chateauneuf du Pape wine and 1 Chateauneuf du Pape Blanc. Cuvee des Sommeliers Chateauneuf du Pape Rouge is made from a blend of 66% Grenache, 12% Syrah and 10% Cinsault. However, the estates also owns some Mourvedre vines as well. The Grenache is on average more than 50 years of age. A partial destemming of the grapes take place. The wine is aged in a combination of old foudres and small oak tanks for an average of 18 months in older, used barrels before bottling. Cuvee des Sommeliers Chateauneuf du Pape Blanc is produced from a blend of 35% Grenache Blanc, 35% Clairette and 30% Bourboulenc. 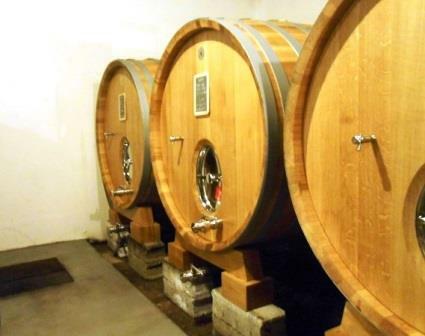 The wines are aged 4-6 months in vat before bottling.harvest is sold to negociants. Cuvee des Sommeliers can be enjoyed on the young side. Young vintages can be popped and poured, or decanted for about 1 hour, give or take. This allows the wine to soften and open its perfume. Older vintages might need very little decanting, just enough to remove the sediment. Cuvee des Sommeliers is usually better with 2-4 years of bottle age. Of course that can vary slightly, depending on the vintage. In the best vintages the wine should be consumed within 3-12 years after the vintage. Cuvee des Sommeliers is best served at 15.5 degrees Celsius, 60 degrees Fahrenheit. The cool, almost cellar temperature gives the wine more freshness and lift. Cuvee des Sommeliers is best served with all types of classic meat dishes, veal, pork, beef, lamb, duck, game, roast chicken, roasted, braised, stewed dishes, sausage, barbecue and cassoulet. Cuvee des Sommeliers is also good with Asian dishes, hearty fish courses like tuna, mushrooms, cheese, pasta, eggplant and tomatoes. The white wine of Cuvee des Sommeliers is best served with a myriad of different seafood dishes, shellfish, crab, lobster, sushi, sashimi, chicken, pork and veal, as well as Asian cuisine. While most of the wine is bottled and sold as Cuvee des Sommeliers, a portion of the harvest is sold to negociants. Medium bodied, elegantly styled, fresh and forward, this fresh, red berry focused wine is ready for early consumption. The wine was made using 65% Grenache, 15% Syrah, 15% Mourvedre and 5% Cinsault. Red fruits with a distinctive floral accent, the wine is medium bodied, soft and elegant, finishing with sweet, spicy kirsch notes.